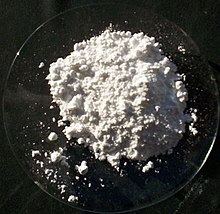 To test whether a mineral or rock contains calcium carbonate, strong acids, such as hydrochloric acid, can be added to it. If the sample does contain calcium carbonate, it will fizz and produce carbon dioxide. Weak acids such as acetic acid will react, but less quickly. All of the rocks/minerals mentioned above will react with acid. This page was last changed on 28 August 2017, at 13:41.